Sarcasm doesn’t travel well over text message — and I can say that through bitter experience. I’ve probably come close to being slapped, dumped, kicked in the crotch, fired, and/or run over by a riding mower because of some sarcastic text I’ve sent that was misconstrued as mean when it was supposed to be hilarious. Or so I’ve imagined; I have no real gauge, because in each instance I couldn’t actually see the reaction on the face of the recipient. 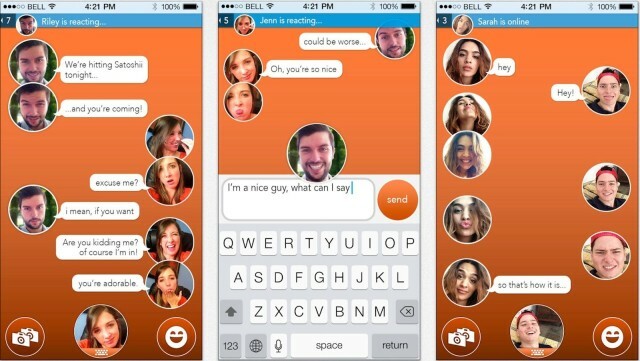 At least one of the developers behind React Messenger must have faced the same problem, because they’ve come up with a solution that snaps and sends a quick, expressive selfie along with each text. React can even do away with text altogether and let users simply make faces — or whatever — at each other all day long. Another cool feature is the ability snap simultaneous front and back camera shots, and send them together. Yes — you can sparrow face while simultaneously snapping a shot of actual sparrows! Then send them off together to a suitably impressed recipient. Just make sure you’ve iOS 7 installed on your iPhone, because React won’t work with anything else.